Learn it Grow it Eat it has recently completed it's fifth summer internship program. Over the five years we have employed 60 youth (46 female) - for many them, their first job opportunities". Over this time the summer program has evolved into its current shape. We have experimented with different formats, tried out different activities and figured out the best ways to motivate and inspire our teen interns. We are confident that this model is highly replicable and look forward to advising other groups in the future who wish to start similar programs. Below is a list of what we consider to be some of our best practices for a 6-week nutrition/environmental education summer youth development project that allow for our interns to explore their environment, community and themselves. We set up a program structure that allow youth to explore different gardens and in each garden work on the development of different skills. Our fifteen summer interns are divided into three groups of five. Each group spends two weeks in one of three gardens and then rotates to the next garden. Each garden has a theme. At the Model T Community Garden interns create an outdoor classroom for neighborhood school/day camp children. The interns collaborate to develop and lead small groups of children through garden/plants based activities. At the JDD Community Garden interns learn basic carpentry and cooking skills that they demonstrate at our weekly farmers market and use to prepare a weekly lunch for the entire group of fifteen. At the Wishing Well Community Garden interns learn and hone their gardening skills. They learn to plant from seed and transplants, proper watering techniques, organic gardening strategies, weed identification, how to compost, and when to harvest. The theme of diverse experiences is replicated at our weekly farmers market where each group of five takes turn selling our produce, demonstrating cooking techniques, and providing nutrition education to our customers. 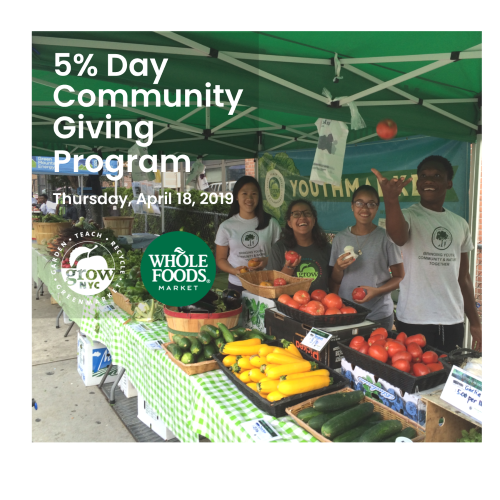 We provide opportunities for the youth to interact and contribute to their community through the running of our farmers market, teaching about healthy/unhealthy eating, cooking, donating unsold food to local food pantries, working with small children and constructing benches and other gardening equipment that we will be used by fellow community gardeners. Working in community gardens - as opposed to a school garden - allows for inter-generational multi-cultural exchanges with other gardeners. Interns work together in small groups of five with a designated educator/group leader for two and a half days and work/meet as a larger group at our weekly market and group lunches. In the smaller groups they collaborate and work together, they learn to get along with each other, resolve conflict and make friends. By end of summer they develop a sense of group pride. In the larger groups they share communal meals and experiences. Many of our interns tell us that they enjoy the summer program because, unlike school, the activities are hands-on and applicable to the real world. They feel that they can learn at their own pace. We try to create a friendly environment for teens who are having difficulties with English or in a traditional academic environment to feel that they can contribute, succeed and learn practical skills that they can use in the future.